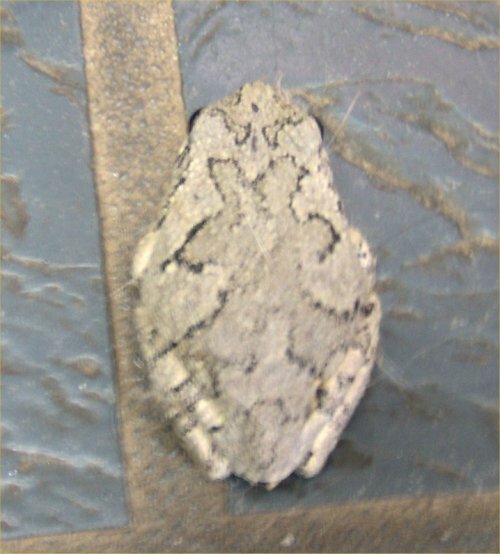 A gray treefrog (probably male) that my father found on the pool cover on 4/24/10. Hyla versicolor are Hyla chrysoscelis are two species of loud gray treefrogs. Adults grow to about 2.5 inches with females noticeably larger. Most that I find are under 2 inches long. 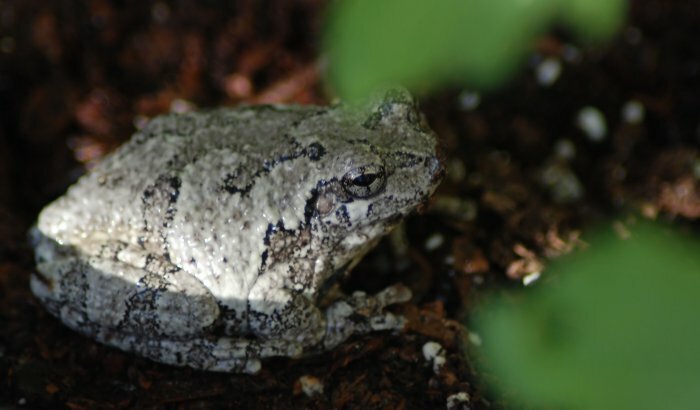 Gray treefrogs are mostly gray but can vary quite a bit in coloration from almost green to gray to white to black even. They have little bumps on their skin and webbed feet. They can use their sucker feet to climb trees, walls, and most vertical surfaces. 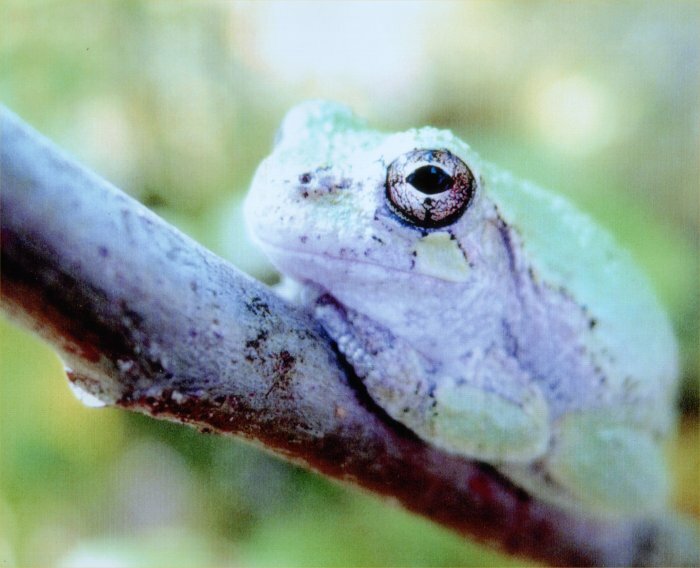 I had always assumed that my gray treefrogs were Hyla versicolor until I went to this site on gray treefrogs and listened to the songs of that species and Hyla chrysoscelis or Cope's gray treefrog. 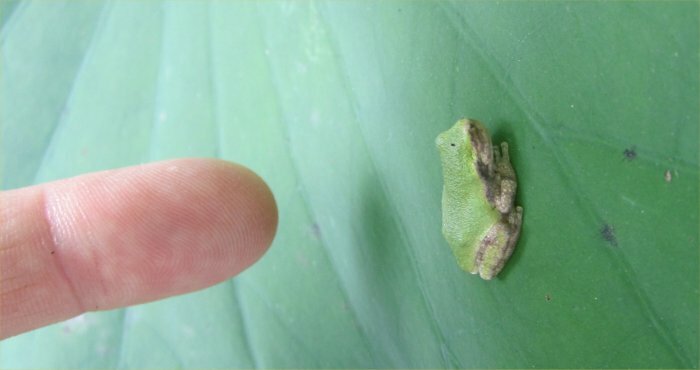 The ones I have sound like Hyla chrysoscelis ! I am confused as to what they really are! From late spring to late summer, the males come out of the trees to sing like crazy. They are very loud. 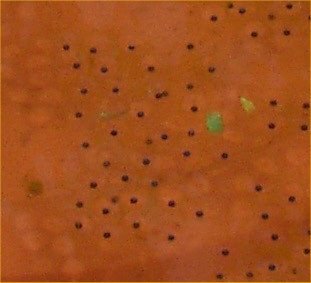 When females show up (fewer of them than males), they lay small (1") circular jelly-like masses of eggs. 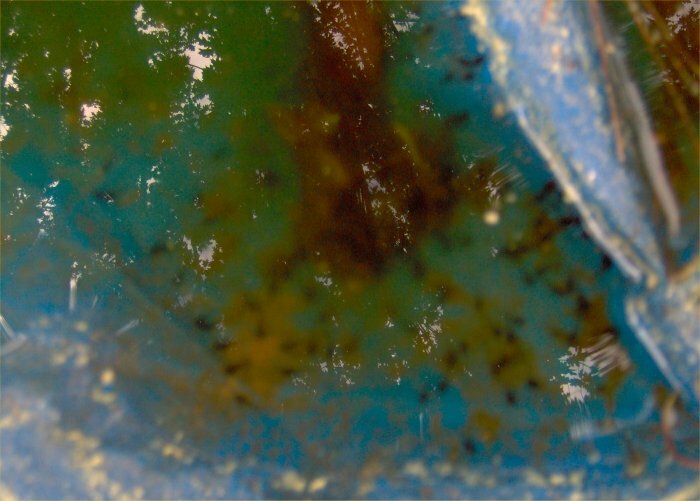 Most eggs and tadpoles get eaten if there are fish, dragonfly larvae, and other predators around. Some change to frogs in a few months and head for the trees. 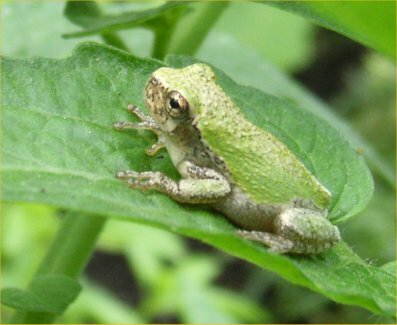 Fish will eat gray treefrog eggs so the adult gray treefrogs normally try to lay their eggs in shallow, fishless waters. These could be vernal (temporary) ponds, small human-made ponds, pool covers, or even puddles. 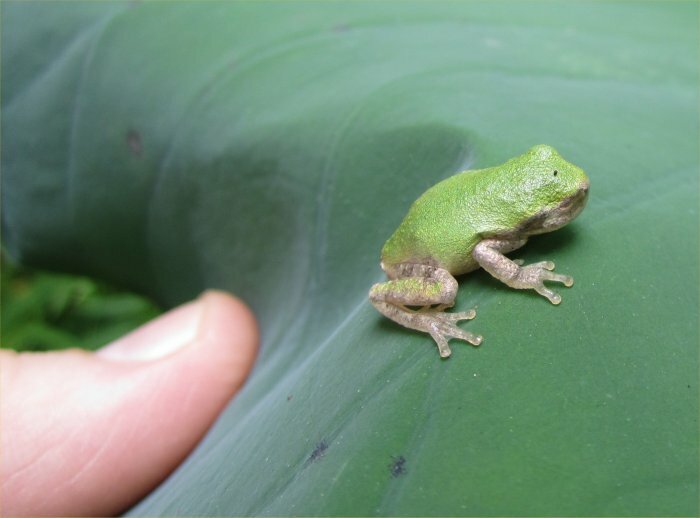 Newly morphed gray treefrogs are mostly green and are often mistaken for green treefrogs. I made this mistake. We have gray treefrogs that call from the trees from April in to the fall. In May, they come down from the trees to the pool cover to call and sometimes lay eggs. They avoid all my ponds from the 18 gallon liner pond with no animals in it to the 50 gallon tub pond with no fish to the largest 1800 gallon pond full of fish and other animals. 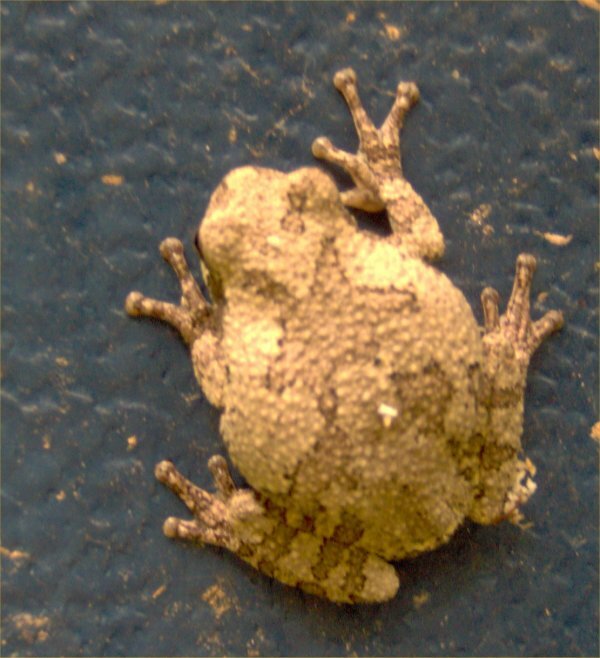 Every year, the gray treefrogs return to the pool but I only rarely find eggs on the pool cover. 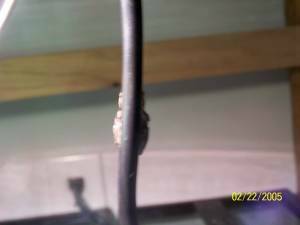 On 5/22/12, I looked at the pool cover for gray treefrog eggs. I found no eggs but there were thousands of tadpoles! I had not seen tadpoles in there before. I tried to catch some tadpoles. Over two sessions, I got about 50 and put them in my new pond. 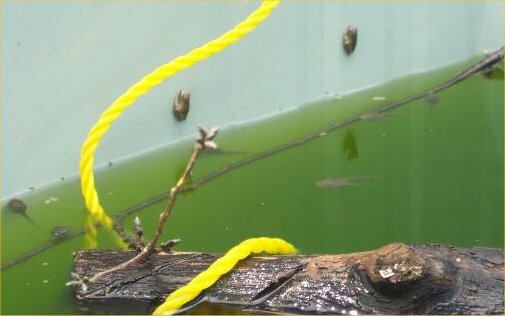 I initiated "Operation Tadpole Rescue" the morning of 5/27/12 and did another round the next morning. I set a plastic colander in a plastic litter bucket and ran the water waste from the pool cover through there. 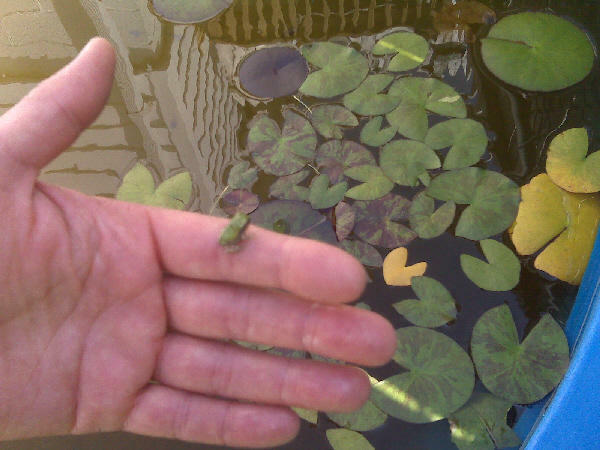 In that way, I rescued hundreds of gray treefrog tadpoles which went in the new 30 gallon pond. I also hand removed more egg masses, dozens of them. 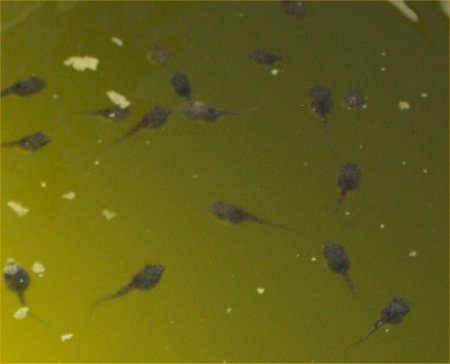 My parents want the pool cover off soon, and it still has probably 1000 tadpoles in there. My mother says, "You can't save them all" but I can try to save as many as I can! If it were up to me, I would not take the cover off until they left. Neither one of my parents has even gotten in the pool in years; they want it open for my 7-year-old niece. I have so many tadpoles in the new pond now that I am feeding them fish food, and I put in some more anacharis from the 153 gallon pond. We took the pool cover off on 6/3/12. I had my brother pour the last of the yucky water through my sieve. 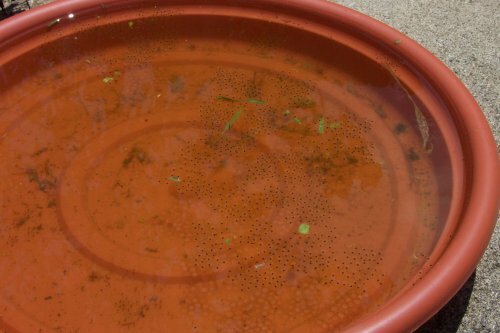 I put the gunk with water and tadpoles in a bucket overnight. I had not counted on the raccoon getting in to it but he only dumped out some leaves and killed a few tadpoles. I used a net to get most of them off the surface and then ran the water though a net. I hand sifted the last of the slop. The tadpoles were all put in my 30 gallon pond out back which now has probably 1000 tadpoles in there! 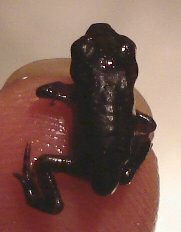 I would like to think that I saved about 80% of the tadpoles but I have a feeling that many will not survive their overcrowded conditions. I did put a few dozen in my 50 gallon tub pond as well. 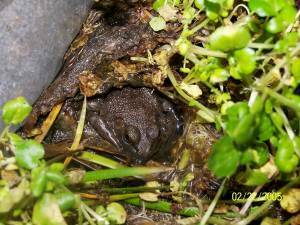 On 5/11/13 and 5/12/13, I moved a dozen gray tree frog egg masses from the pool cover and put them in the 30 gallon liner pond. There were other eggs masses that were out of reach. 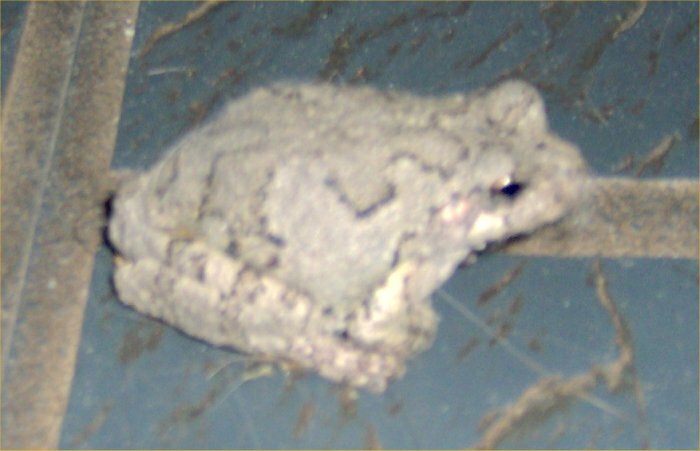 On 10/11/15, I saw this tiny gray treefrog, missing its left eye. He was sunning on my butterfly bench. Gray tree frog - close up; also noted while processing the photo that there is a spot on the left leg that looks like some sort of viral cyst. 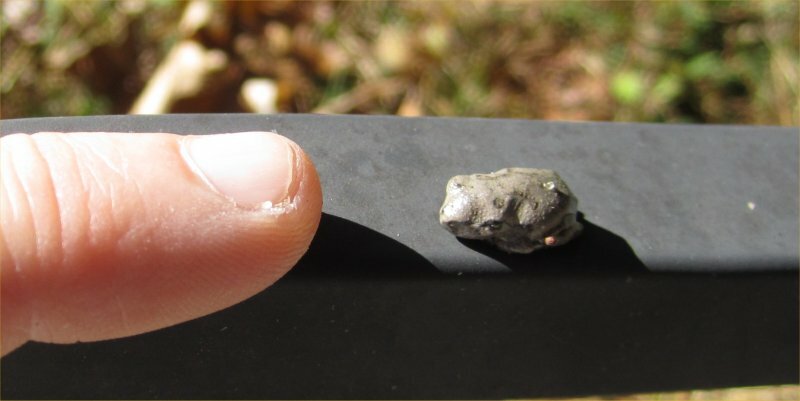 Gray tree frog - farther away with my finger for scale. 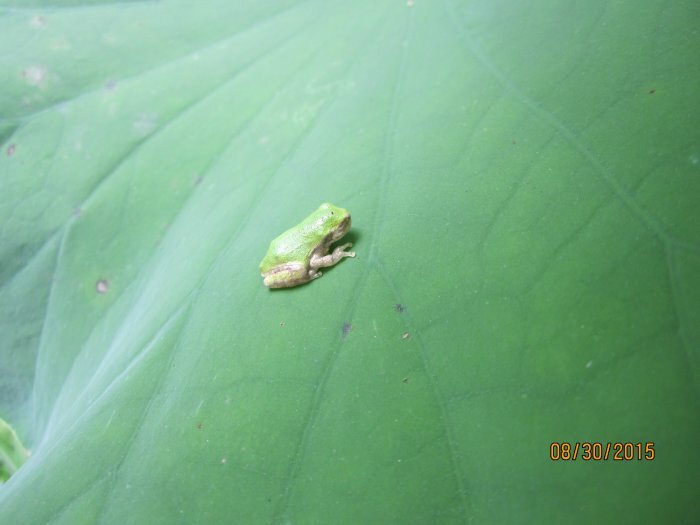 On 8/30/15, I took these photos of a little tree frog I found on my lotus leaf! 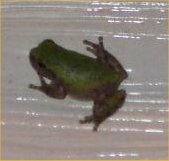 I thought he was a green treefrog but was corrected in October of 2017 that he is a baby gray treefrog. His right eye was missing. 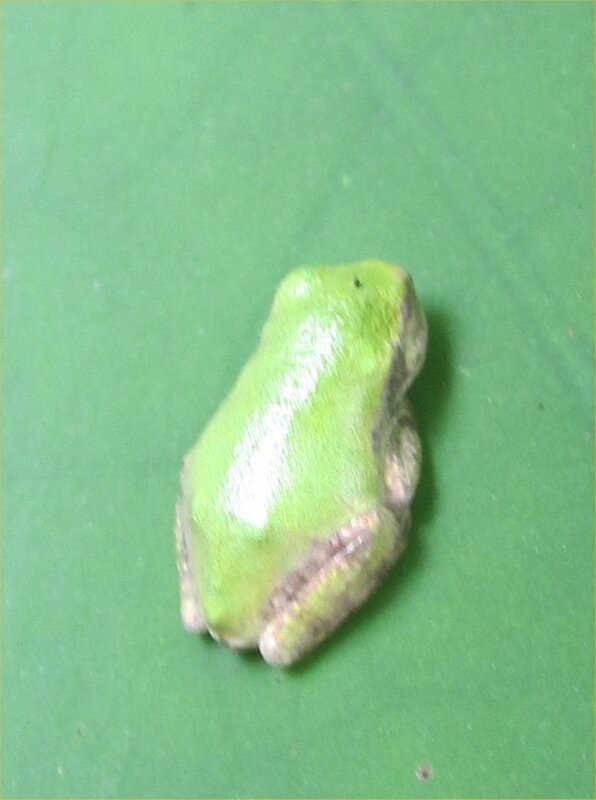 Baby gray treefrog - top view; look at his little sucker feet! 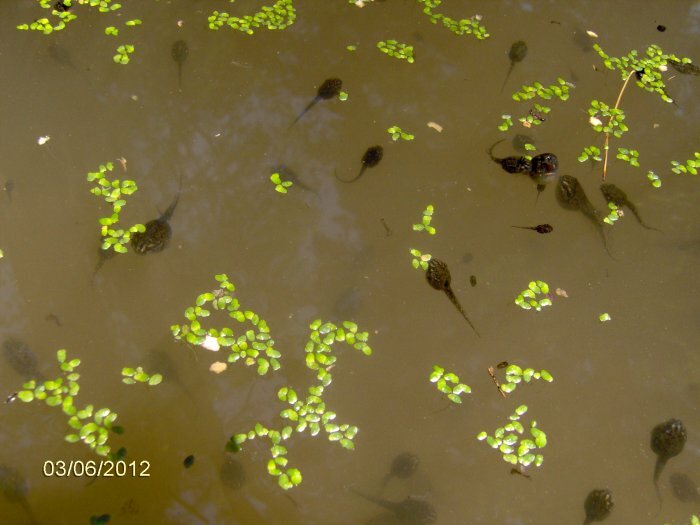 Here are gray treefrog tadpoles in my rock pond on 6/3/12. 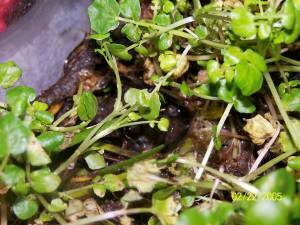 The green plant is duckweed. 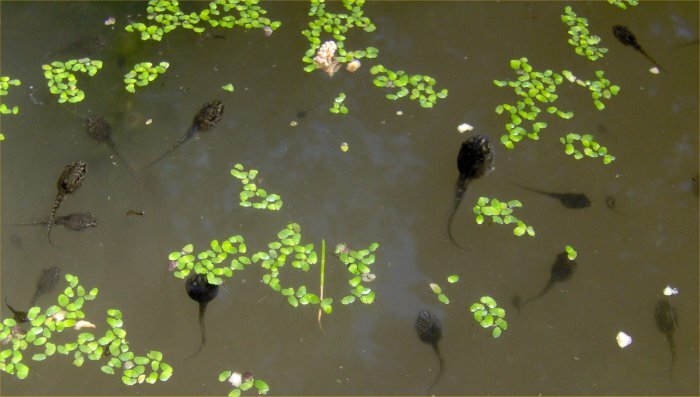 There are two sizes of tadpoles. If you look close, you might see a mosquito larvae or two. 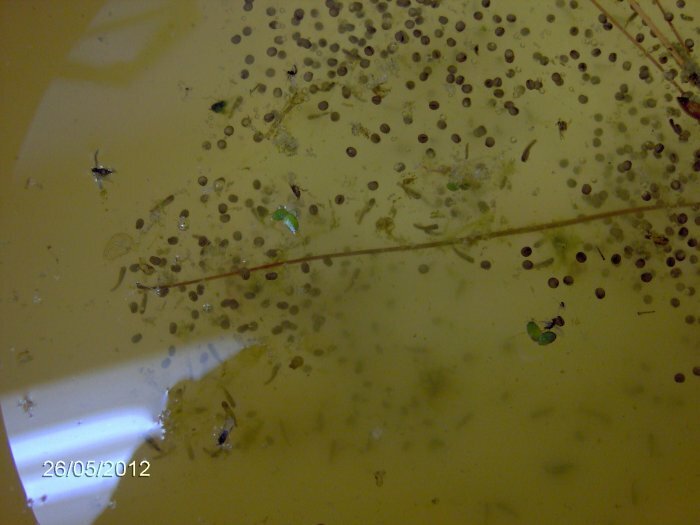 Here are photos from 5/26/12 of gray treefrog eggs that I collected from the pool cover. You can also see mosquito larvae or at least one on the right. 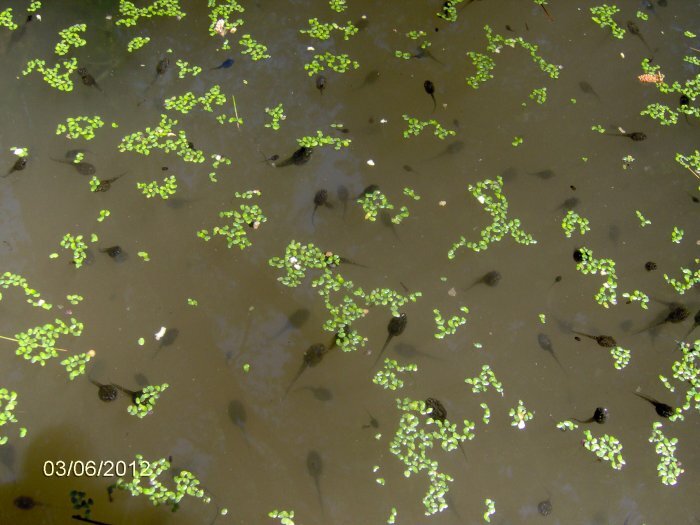 Some of the tadpoles have hatched already (just a few). 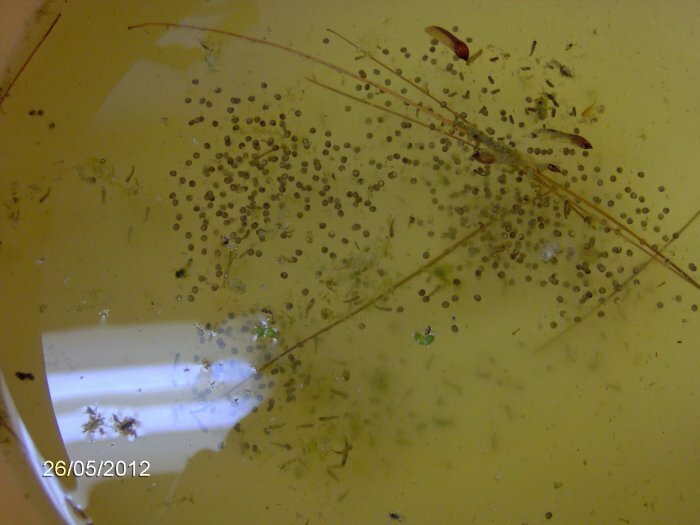 Gray treefrog tadpoles in the pool cover on 5/22/12. 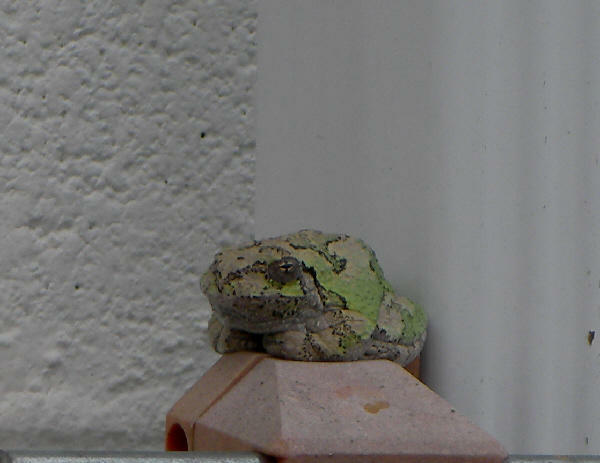 These photos are from 5/6/11 when, imagine my surprise, this female gray treefrog was sitting in the middle of the laundry room. She had been there long enough to become covered in cat hair. I took these photos before putting her outside. 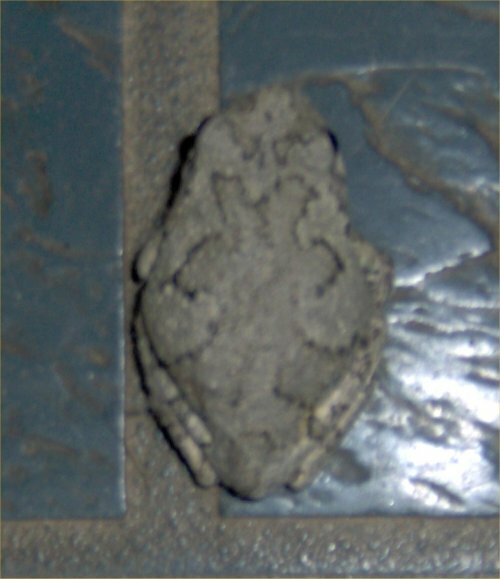 On 4/24/10, my father found a gray treefrog on the pool cover which he was removing. It is probably a male as they had just started calling. I put him in a plant pot and took these photos. 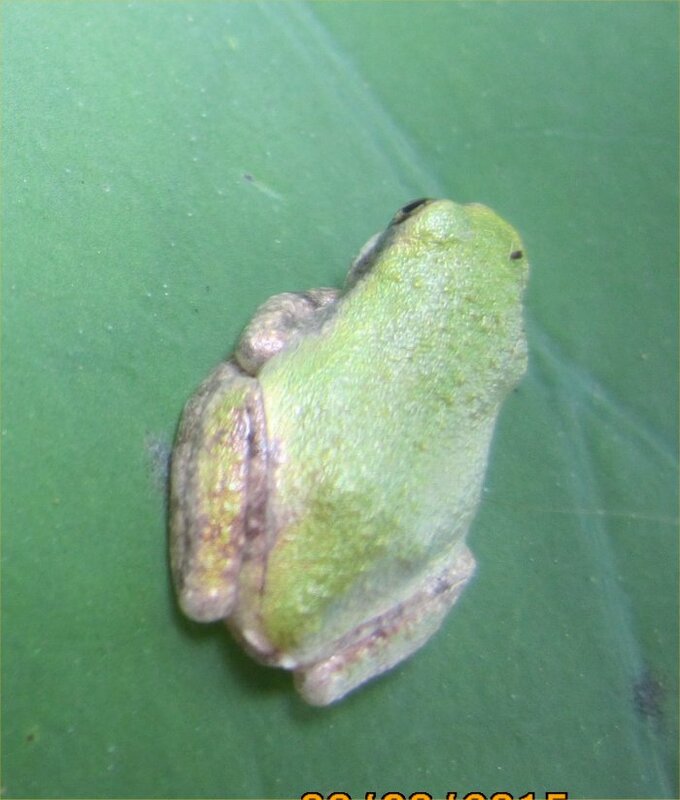 Gray treefrog - top view. 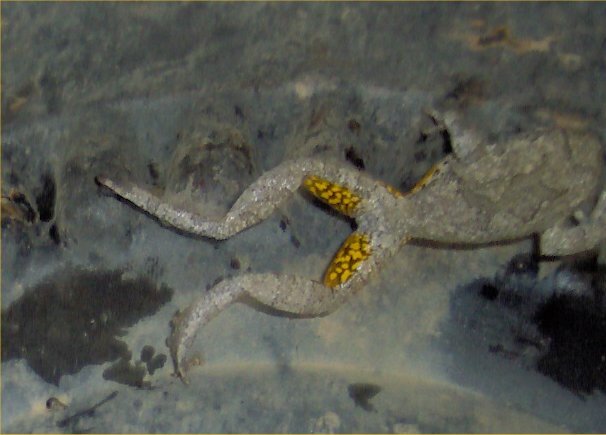 Gray treefrog - hopping away, note the yellow under the back legs which is indicative of gray treefrogs. 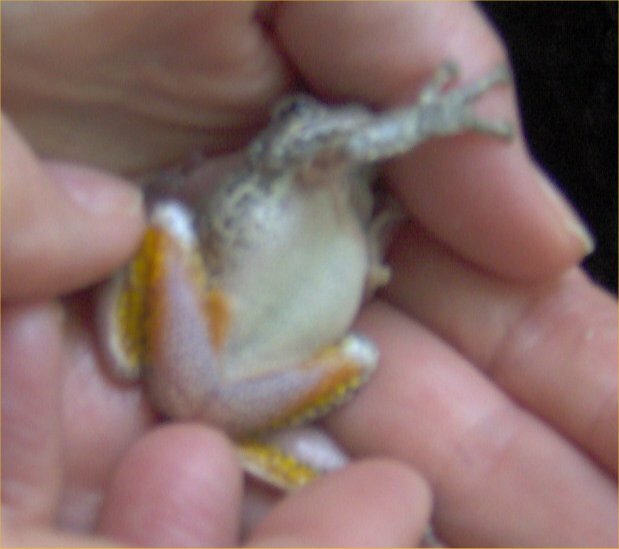 Gray treefrog - my mother trying to hold him upside down to show the yellow on the legs. It is cute how he has his little hand on her finger, trying to grasp and get away. Do not worry. We did not hurt him, and I put him up on a tree right after the photos to go on his way. 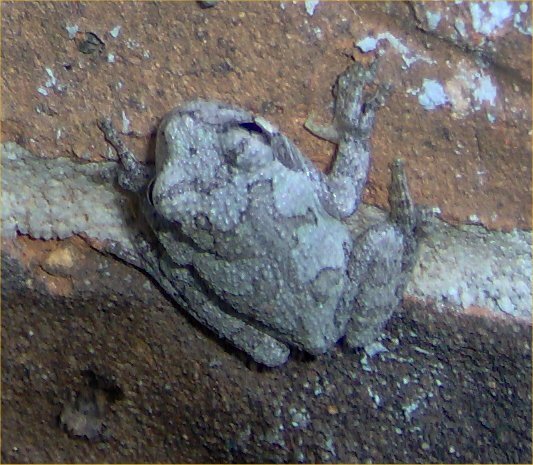 Gray treefrog on the bricks of our house on 9/3/07. 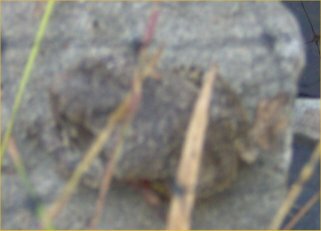 Here are two photos of a gray treefrog (female I think) that I found sitting by my pond on 10/2/05. Her back left leg was mostly gone (just blood and some bone). I do not know if she survived. 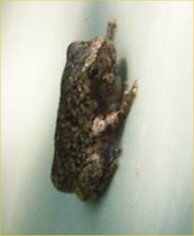 Gray treefrog - 10/2/05, clear photo. 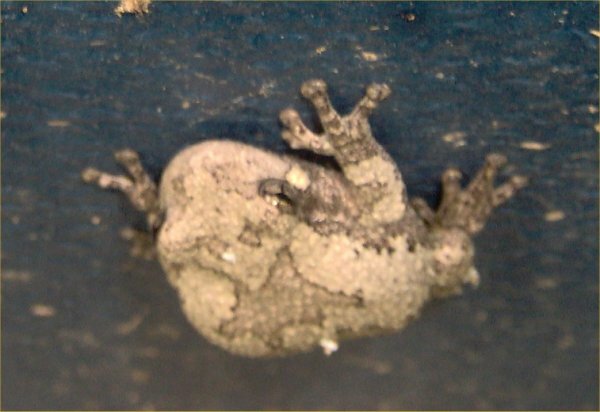 Gray treefrog - 10/2/05, a bit blurry. 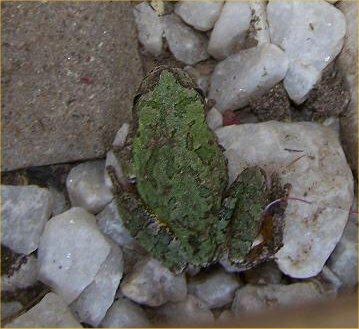 Here is a photo of a male gray treefrog wedged in our pool deck on 6/9/02. Videos are listed from newest to oldest. I took these two videos on 5/7/09. It was dark outside so there is no picture but black. The gray treefrogs were calling as well as a single male American toad. 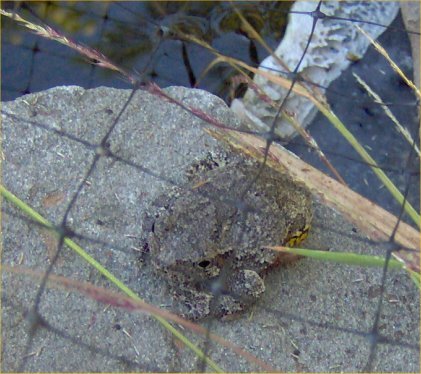 Gray Treefrogs and American Toad Calling - 4459 KB, mpg movie. In this one, the toad is calling for the first four seconds, and the gray treefrogs are calling throughout. Gray Treefrogs and American Toad Calling - 2148 KB, mpg movie. 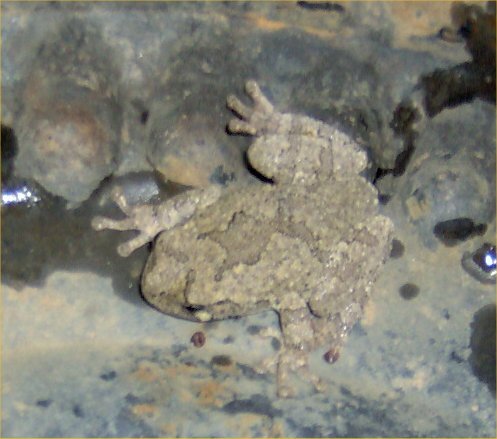 In this one, the toad is calling for the first seven seconds, and the gray treefrogs are calling for two seconds at the end. Gray Treefrogs - 2009 KB, mpg movie. 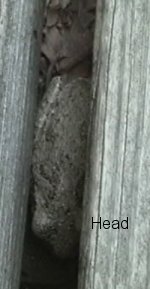 This video is from 7/4/07 but has no actual video, just sound (like with the video below) of the gray treefrogs calling near the pool. Gray Treefrogs - 3274 KB, mpg movie. 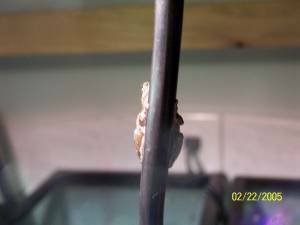 I took a video on 6/26/06 of gray treefrogs calling on our pool cover. I do not know how to capture just sound so there is video but the screen is just black. It was dark outside so this video only has worth as an audio file to hear the frogs. They sounded much louder in person! 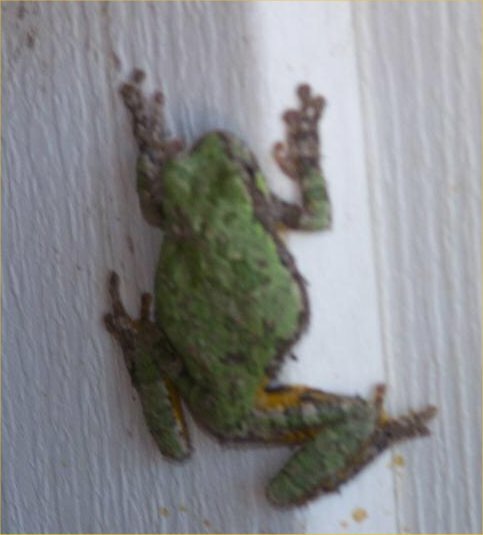 Cindy in Ohio sent these photos of "Popeye" the gray treefrog on 5/16/10. Popeye lost his right eye. 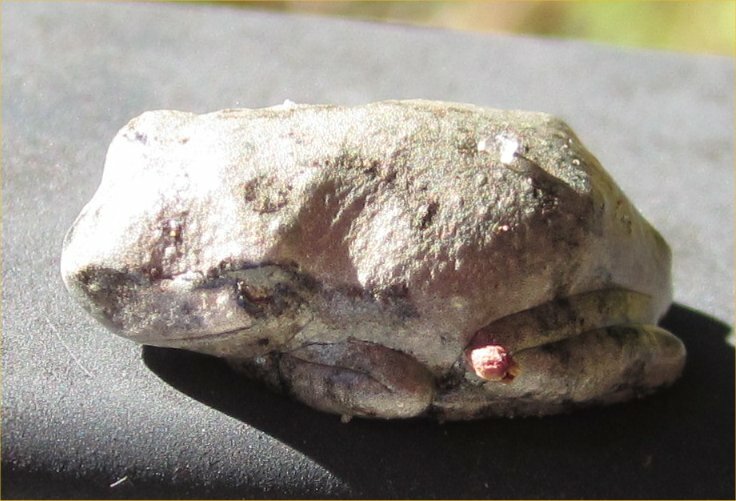 The last photo is one of the gray treefrog babies from her pond. 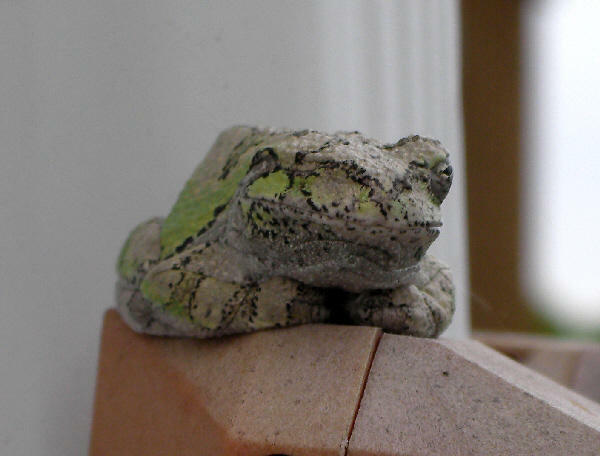 On 8/10/08, Derek sent me this photo of a gray treefrog in Massachusetts. It has more green on it than the species that I have seen around here. Hi to Derek's six animal-loving kids! 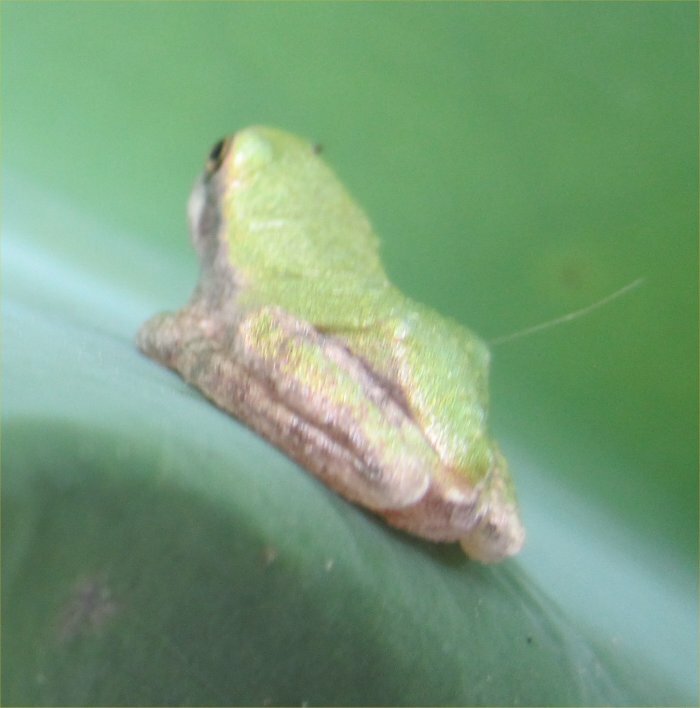 On 6/22/08, Michelle sent these photos of a tree frog in Texas. 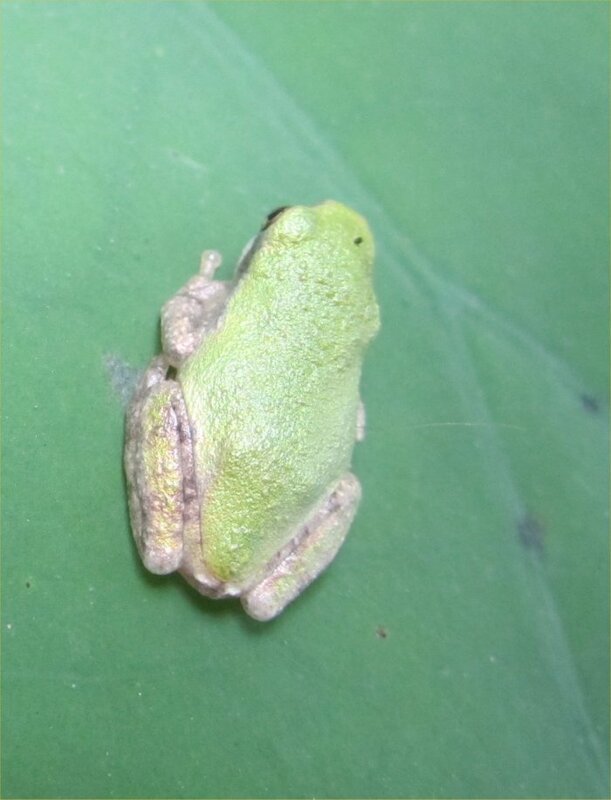 Looking at the species of tree frogs in Texas, only a green variant of the Cope's gray treefrog seems like an option. 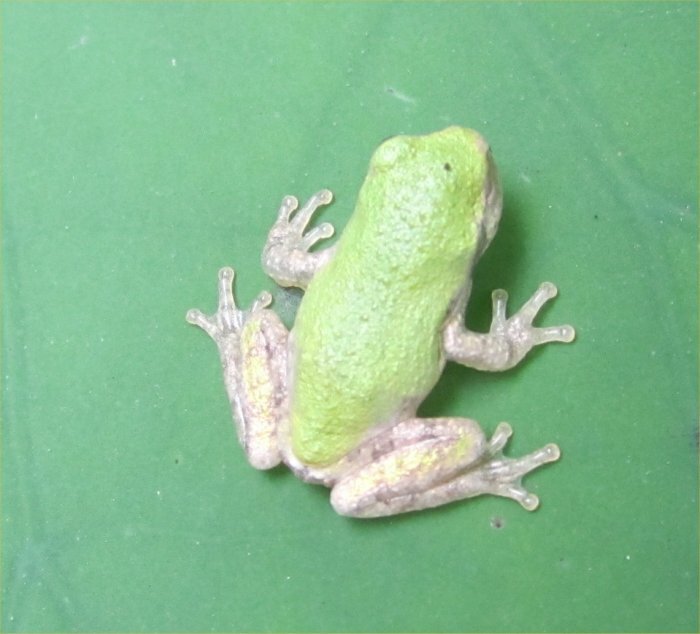 On 5/31/08, Molly sent these photos of a newly-morphed tree frog of unknown species. 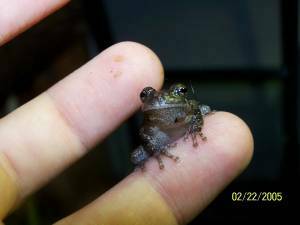 I am putting it on this page simply because gray treefrogs are common so this baby could be one. 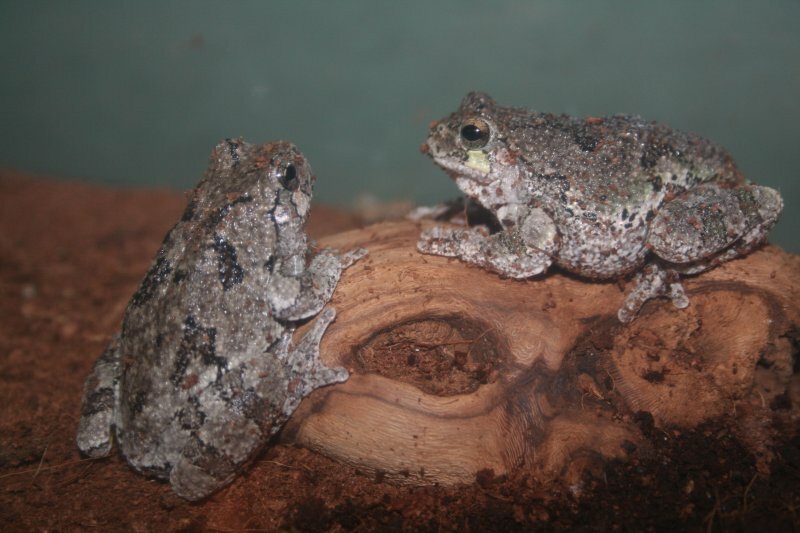 On 12/13/07, Carl sent this photo of two gray treefrogs (I think). He found them in Pennsylvania and kept them as pets (which I do not advocate). On 4/27/07, Daniel sent these photos a tiny little green frog in his pond. 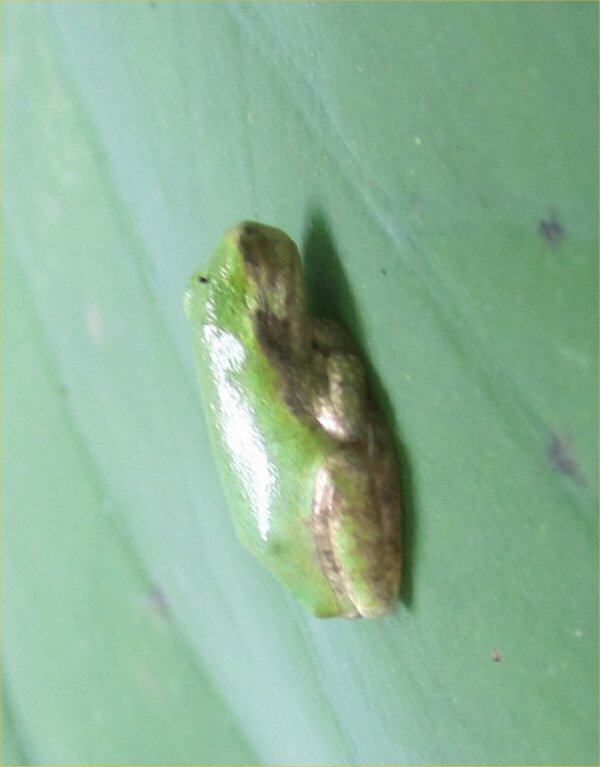 I thougt it is a green treefrog but it is probably a baby gray treefrog. 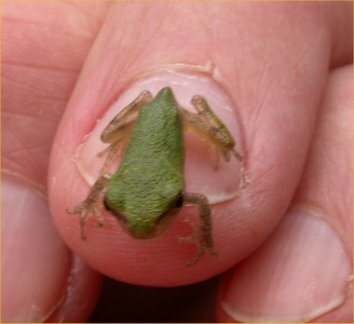 Baby gray treefrog - top view in hand. 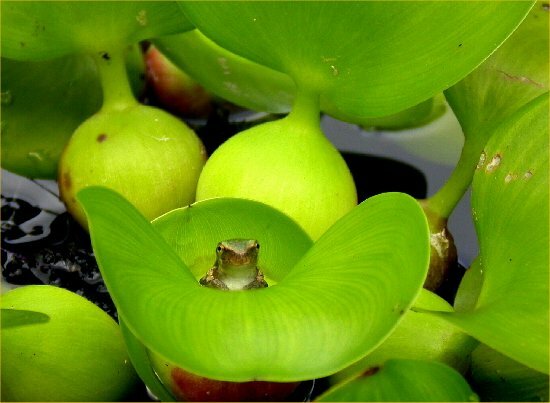 Baby gray treefrog - amongst water hyacinth. 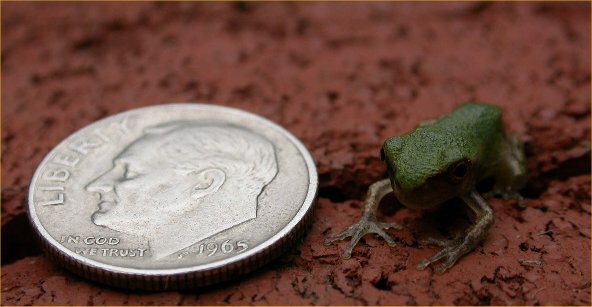 Baby gray treefrog - on the ground, next to a dime. 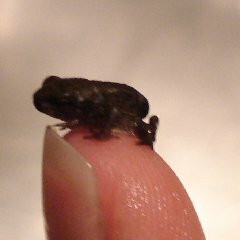 Someone named Sam sent me four photos of little frogs, probably various tree frogs. I lost the e- mail and details but know I uploaded them on 1/31/07. Some little frog - on a stick, same frog as last photo. 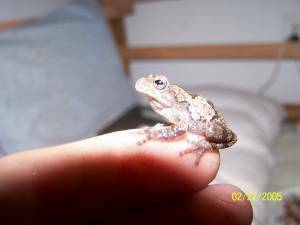 Samantha sent these small photos of small tree frogs on 2/24/05. Some appear to be gray tree frogs but some may be some other kind of tree frogs. Tree frog - cannot really see the frog! 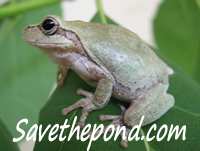 To see a photo of the gray treefrog and hear a call, go to this frog site . To see another photo, hear a call, and get info, go to the Toronto Zoo site. 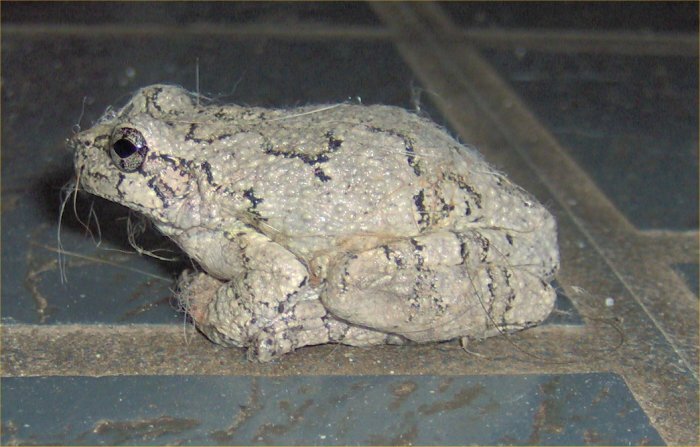 The Herps of Texas web site has a photo, call, and information on the gray treefrog as well. 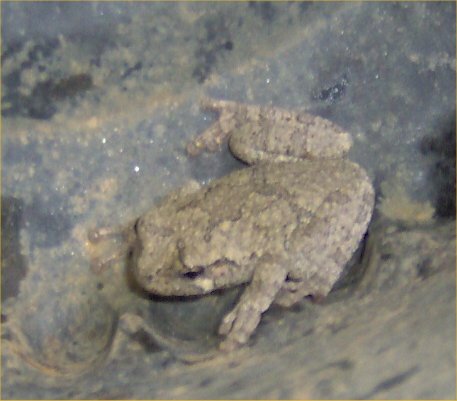 You can hear and see a gray treefrog at Frogs & Toad of Virginia & Maryland - this is an archived version as the site is gone now.